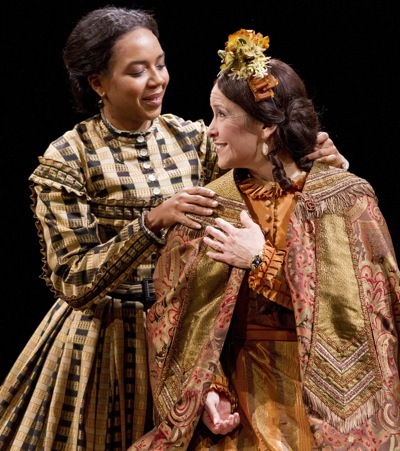 As the DVD of Spielberg’s latest epic, Lincoln, hit shelves last week, the Arena Stage in Washington, D.C. was telling a different Lincoln story: that of Mary Todd Lincoln and her dressmaker, former slave Elizabeth Keckley. Keckley, author of Behind the Scenes, or, Thirty years a Slave, and Four Years in the White House, was born into slavery, bought her freedom, opened her own dressmaking shop and was eventually hired to be the personal dressmaker of the first lady. 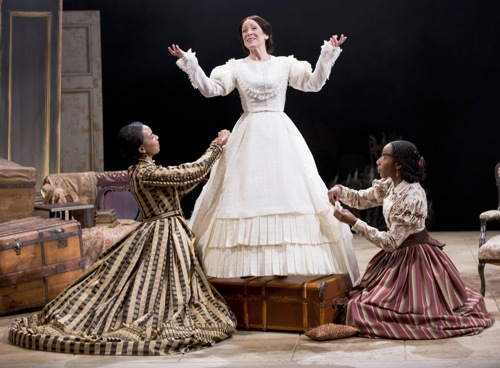 The tempestuous, intensely personal relationship between the two women—born of shopping trips, creative collaboration and the intimate hours spent in fittings— is the subject of Tazewell Thompson‘s new play, Mary T. and Lizzy K.
She not only talked about her life as a girl, as a slave and the horrors that she suffered. She wrote about everything she witnessed in the White House. She wrote about Mary’s emotional swings, her spending habits, the outrageous arguments she had with the president, her insane jealousy. Keckley’s plan was a total failure. Though the book created sympathy for Lincoln, Keckley was widely castigated. It did not sell and Lincoln never spoke to her friend again. Keckley died in a home for destitute women that she, in better times, had founded. I think he’s distilled [Mary] into a kind of essence. It’s a psychological, emotional portrait. There is a fierceness to her. There is a fighting spirit to her. She is a survivor. She has clawed her way out of the world of slavery and wants nothing to do with that world. (And not in a negative way—because she did actually quite a lot for free slaves who came through D.C. She created the Contraband Relief Association, because there was no like guidebook for a freed slave, and she saw that people didn’t know what to do, didn’t know where to go, had no support.) From what I’ve read about their relationship, her assertiveness was possibly why they worked so well together. I think these two women had a similar kind of spirit, but what is surrounding every particle of the atmosphere between these two women is the slave/owner relationship. In the air all around them is a given of inequality due to skin color. But then you’ve got Elizabeth giving Mary instruction. Elizabeth becomes not just a confidante friend but also a caretaker and mother. So these women are negotiating a whole set of relationships both spoken and unspoken. Mary T. and Lizzy K. invites audiences to go on an fantastical journey as well as a historical one. In imagining, “What if these two friends had made up?” Thompson essentially asks us to imagine, “What if the end of the Civil War had represented true racial reconciliation?” But though the audience will find their hearts warmed by witnessing two friends reunited, the truth is never too far away. Abraham Lincoln will be shot. Mary will witness it. Keckley will die destitute. And the races, alas, will not yet have put aside all their differences 148 years later. The play is well worth seeing. Reconciliation, after all, is a process, and storytelling can be an important part of it. If you’re in D.C., spend a night at Arena Stage imagining a different ending to the story. To read more of the interviews with the artists, click here. Photos of Sameerah Luqmaan-Harris as Keckley, Naomi Jacobson as Lincoln and Joy Jones as Ivy (Keckley’s apprentice) by Scott Suchman.